Most of the time, when I have an idea for a new recipe, I’m hungry and daydreaming about food. This sauce dreamt itself up on day when I was relaxing in bed with a book. Of all of the recipes I’ve created to date, it may just be my favorite. There’s nothing better than a heaping bowl of creamy pasta… Oh wait, there is. A heaping bowl of creamy pasta that won’t give you a terrible stomach ache! With a base of olive oil, hemp seeds, lemon juice, and avocado, this rich, flavorful sauce will make you do a happy dance. Don’t fight it. Just savor the magical flavors on your tongue and let the happiness wash over you. 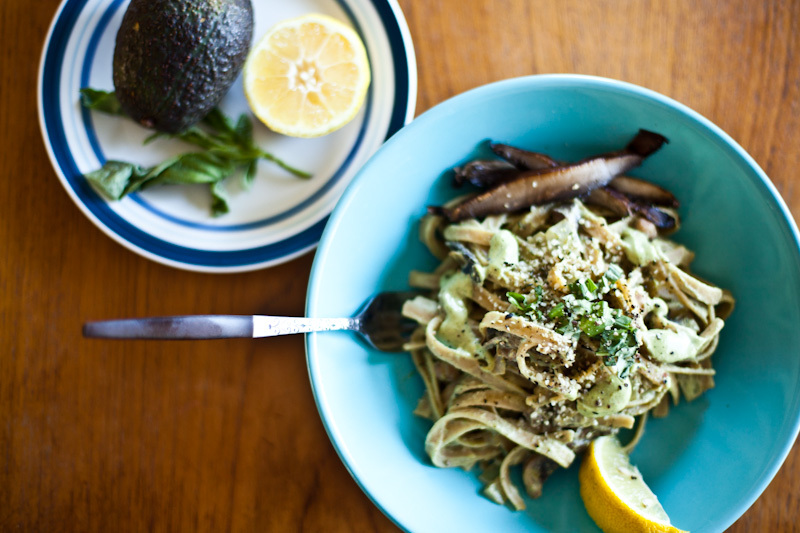 This vegan alfredo sauce tastes decadent, but is made with simple, healthy ingredients. If you roast the garlic the night before with a panful of veggies, you can prepare this sauce in under five minutes! If you are vegan and missing dairy, this vegan roasted garlic alfredo is for you. If you aren’t vegan, but want to eat healthier without sacrificing flavor, this is also for you! Add all alfredo ingredients to a blender and mix until smooth and creamy. Boil the pasta according to the instructions on the package. In a large pan, sauté the onion with the oil on medium heat for 1 minute until slightly translucent then add the mushrooms. Cook until the liquid from the mushrooms mostly cooks off, about 5-7 minutes. Add the chickpeas and alfredo sauce. Let simmer for 2-3 minutes heated thoroughly then add the cooked pasta. Mix well and serve immediately! *To roast the garlic, trim the ends off of each head. Drizzle with olive oil, wrap in foil, then bake at 400F for 40 minutes. I suggest doing this the night before (along side a pan of roasted veggies!) to save time. *If you are cooking for less than 4 people, I recommend setting the half of the sauce and veggie mixture aside. It will keep better in the fridge and reheat better if the pasta is added just before serving. *I cooked a few portobello slices separately to use as a garnish, then added chopped basil for color and a touch more robust flavor. Top it off with a squeeze of fresh lemon, a sprinkle of sea salt and hemp seeds, and a few dashes of cracked pepper. *Broccoli may be used in place of portobello mushrooms to add some green to the dish. Great recipe, can’t wait to try it! Could I sub hemp seeds for chia seeds? Chia seeds won’t do the trick here, but soaked sunflower seeds or cashews will work! Hi, I’ve just been reading up on the dangers of aluminium and baking food in aluminium foil. Some of the aluminium can leach into the food we roast or bake.I think you will find roasting garlic on a tray lined with baking paper will work just as well. That’s excellent advice Kristyne, thanks for the tip! Are the hemp seeds cooked first? Wonderful! I made this recipe and it was a huge hit. I did not have hemp seeds, so I subbed for almond meal. I’ll definitely give it a try with the hemp seeds next time. Thanks for the recipe. My five year old loved it and her very fussy friend ate some too! Are the noodles egg free as well? Could you use lime instead of lemon? I haven’t tried that substitution before, it will likely change the flavor but it may taste good! If you try it with lime, please let us know how it turns out! I tried it with lime because thats all I had. it gave it a bitter taste I wasnt happy with it. Next time I’ll do lemon for sure. How long will the dressing last in the fridge??? Great Recipe! Do you ever make non-dairy cheese? Do you have any idea of the calories/carbs/fats/proteins per serving? It was great! My favorite recipe of yours <3 thank you!! !